Winner 2005 Nashville Song Service Competition, First Prize, R&B Category. The lyric notes for each CD album show the prize winning songs. 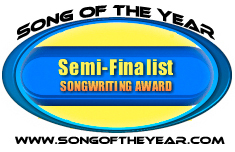 Runner Up 2009 (Adult Contemporary), Runner Up 2007 (R&B), Honorable Mention 2007 (Rock), Suggested Artist 2007 (Popular Vote), Semi-Finalist 2013, Song Of The Year Competition, Houston. Hello! My name is Turqueza, Spanish for Turquoise. I'm the logo and mascot for YoCaHuNa, and like the music on this site, I'm a blend of invention. The Triggers are one of the most colorful fish families in the world, having all the tints of the rainbow, and I'm a global mixture of the Clown, Queen, Picasso and Reef Trigger fishes found in the Indian Ocean, Pacific and Caribbean. My trigger finger is the combination hinged spike and latch on my head which I can use to lock myself into my coral den while I'm dreaming and scheming. Click on the labels below to see the list of songs, read the lyrics, hear mp3 samples or buy mp3 files or lyrics & chord sheets.